Why would you need Microscope Immersion Oil and How to use it. When light passes from a material of one refractive index to another (for example: from glass to air), it bends. In the space between the microscope objective lens and the slide (where air is), light is refracted, the light scatters and it is lost. The refractive index of air is approximately 1.0, while the refractive index of glass is approximately 1.5. When light passes through both glass and air it is refracted. Light of different wavelengths bends at different angles, so as objects are magnified more, images become less distinct. Basically when using lower magnification microscope objective lenses (4x, 10x, 40x) the light refraction is not usually noticeable. However, once you use the 100x objective lens, the light refraction when using a dry lens is noticeable. If you can reduce the amount of light refraction, more light passing through the microscope slide will be directed through the very narrow diameter of a higher power objective lens. In microscopy, more light = clear and crisp images. By placing a substance such as immersion oil with a refractive index equal to that of the glass slide in the space filled with air, more light is directed through the objective and a clearer image is observed. Take a look at the images captured below. The images were captured using the UX1 microscope with the 100x Achromat objective lens and the 100x Plan Achromat objective lens. Observation was performed dry and with immersion oil. Notice the difference in image quality between the images captured dry versus those captured with immersion oil. 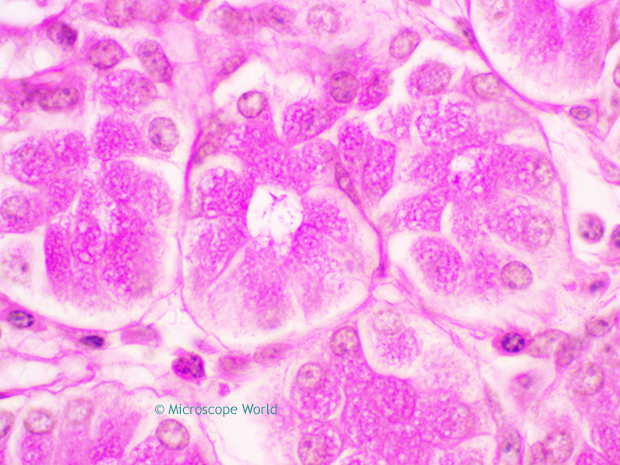 Microscopy image of duodenum captured using 100x Achromat objective lens, dry. 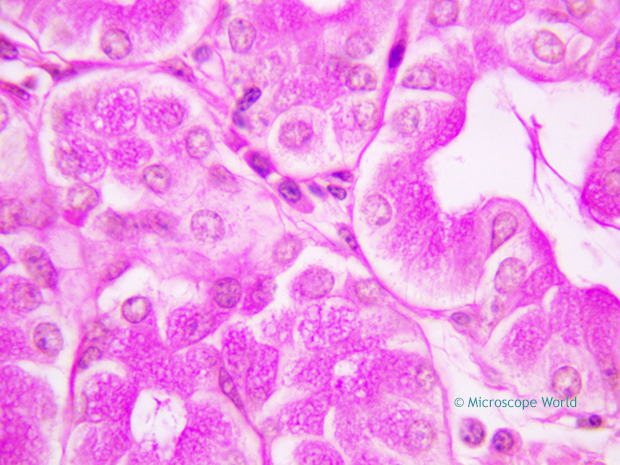 Microscopy image of duodenum captured using 100x Achromat objective lens, with immersion oil. 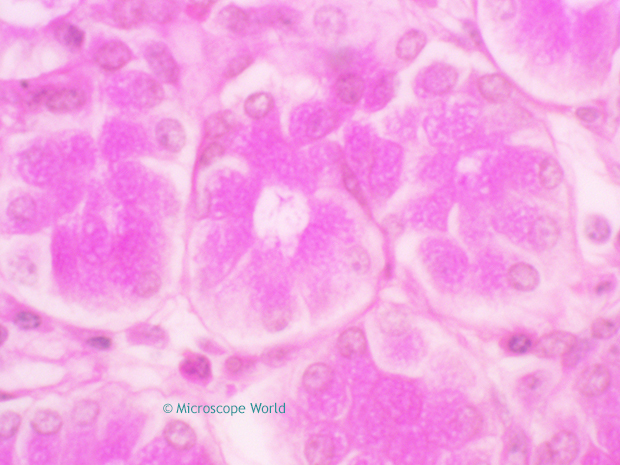 Microscopy image of duodenum captured using Plan Achromat 100x objective lens, dry. 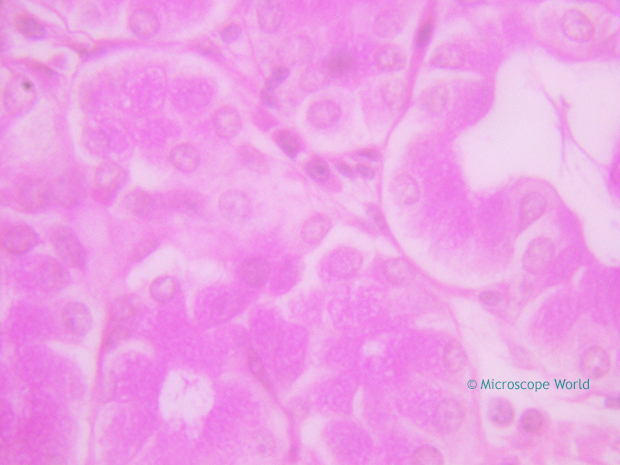 Microscopy image of duodenum captured using Plan Achromat 100x objective lens, with immersion oil. Before using immersion oil, make sure that your 100x objective lens is made for use with immersion oil. Begin by focusing your sample using the 40x objective lens. Rotate the objective lens part way between the 40x and 100x lens so you can reach the cover slip on your slide. Place a drop of love viscosity, Type A immersion oil on the top of your cover slip and another drop directly on your 100x oil objective lens. Slowly rotate your 100x oil objective lens into place and adjust the fine focus until you get a crisp and clear image. When finished viewing with your 100x oil immersion lens, carefully wipe the oil from all glass surfaces using a piece of lens cleaning paper. Use a second piece of lens paper moistened with a small amount of alcohol (ethyl or isopropyl) or lens cleaning solution, wiping all glass surfaces again to remove any remaining oil. Failing to remove immersion oil from lenses will result in hardened oil on lenses that will affect future clarity. If you need to remove immersion oil that has been left on a lens and hardened, moisten lens paper with a small amount of xylene or microscope lens cleaning solution. Gently wipe lens surfaces, allowing enough time for the solution to soften the hardened oil. Once oil is removed wipe surfaces again. When To Use Microscope Immersion Oil? Immersion oil should only be used if you have an immersion oil lens. The lens will actually have "oil", "immersion" or "HI" (homogeneous immersion) printed on it. Immersion oil is best for viewing samples that are dead or are not moving and no thicker than a few micrometers. Very small moving protists can occasionally be viewed with immersion oil, but the best specimens for oil immersion do not move. Oil immersion is required when viewing individual bacteria strands or details of striations in skeletal muscle. Immersion oil should be used anytime you want to view a clearer image at 1000x. There are several disadvantages to using immersion oil. For example, a wet mount slide must be incredibly secure in order to use immersion oil with it. If switching between a dry 40x lens and a 100x oil lens, care must be taken not to get oil on the 40x lens, which could damage it.